Updated 08/14/10 - Added a new set of latest acquistions as seen to the right. Updated 06/27/10 - Added a few more bookmarks. Click here to see the group. Updated 12/19/09 - Added a new set of latest acquistions as seen to the right. Updated 10/16/09 - Added a new set of latest acquistions as seen to the right. Updated 05/23/09 - Added a new set of latest acquistions as seen to the right. Of particular note are the three old Gorham pieces. Updated 01/10/09 - Happy New Year everyone! Added a new set of latest acquistions as seen to the right. Updated 10/03/08 - Added a new set of latest acquistions as seen to the right. Updated 5/30/08 - Added a new set of latest acquistions as seen to the right. I've hit the 1100 bookmark mark! Updated 4/19/08 - Modified the Hallmarks page. Found out half of the unknown hallmarks and added the location of the manufacturer. Click on the hallmarks link on the navigation menu at the top of the page or here. Updated 4/05/08 - Added a page of patents of bookmarks. 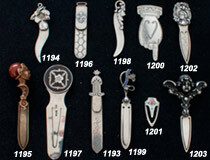 Each patent listed pertains to one or more bookmarks in this collection. Click here to get to the patent pages. Updated 4/04/08 - Added a new set of latest acquistions as seen to the right. Also modified all small bookmark pictures found as a result of browsing. They are all now larger and angled. Updated 2/17/08 - Added a new set of latest acquistions as seen to the right. Updated 12/31/07 - Added the story on how I started collecting bookmarks. Read it here. Updated 12/09/07 - Added a new set of latest acquistions as seen to the right. Updated 10/21/07 - Added a page of hallmarks. Click on the hallmarks link on the navigation menu at the top of the page or here. A few new features were added recently. On the top navigation, a references link was added which takes you to a page describing all of the books and catalogs that I have in my collection. From there you can see the covers and backs of the books and the catalogs as well as the pages in the catalogs that have bookmarks. Also, you can click on the highlight bookmarks link on the catalog pages to see which bookmarks I have in this collection. You can get directly to a list of books and catalogs with the new category to the left.